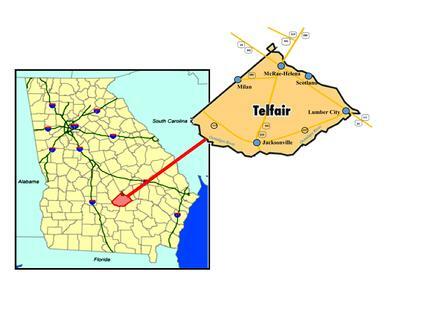 Located in South Central Georgia, McRae-Helena draws its workforce from local programs and regionally. McRae-Helena is the intersection of five major state highways: 441, 341, 280, 319, and 23 and provides easy transportation access to major cities in the Southeast. McRae-Helena is 30 miles from Interstate 16 and 70 miles from Interstate 75. Highway 341 is now four-lane from the Brunswick Coast to Perry, GA where it intersects with Interstate 75. Many travelers think the only way to get from the beautiful coastal area of Brunswick, St. Simons, and Jekyll to Macon and other points north is to traverse I-95 to Savannah and then pick up I-16 and travel west to Macon. If the now four-laned Highway 341 were traveled instead via McRae-Helena, it would save them approximately 50 miles. They would also be able to enjoy many beautiful and historic sites along the way.